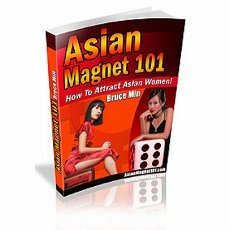 Review for Asian Magnet 101 Course - Basic Package, Terrible. One Idea Merged with Ripped Off Mystery Method Material. "Terrible. One Idea Merged with Ripped Off Mystery Method Material." Pass on this one. Check out our ranking of Dating Asian Women advice to find better advice. This book is 90 pages long, and most of the book goes over one idea. Repeatedly. It's not a bad idea, but it can be said in one page and doesn't justify making an eBook. The rest of the material is ripped off from Mystery Method. The writer makes broad assumptions about Asian women, bundling them all into one group that you should treat the same. Anyone who knows Asian women, knows that comparing the way a Japanese girl communicates to a Filipino or Thai girl has no bearing. There are as different as a Latino to an American. Based on his writing he is an Asian American who is talking about Asian American girls (ABCs, ABKs, ABJs etc.). So in truth the book is more about his ideas on how to approach Asians who have grown up in the states - very different from Asians in their countries. Although extremely basic I liked the first ideas he communicated about Asian Repellants and Socializing - in my experience if someone experienced understands these concepts it makes his life a lot easier with Asian women. They are nothing new, taken from Maniac High's original stories about "Mr. Smooth" way back in the late 1990s (which is where the author found this I'm sure). If from these points he had gone deeper instead of just transitioning to give you his version of the Mystery Method this could have been a useful book. Pity. Half way through the book he turns to teach you about Mystery Method concepts and the approach. It's a dumbed down version, but he's tried to lay most of it out. I'm guessing the author has read a lot of pick up artist community materials, because he uses a lot of its jargon without explaining it. For instance "Telegraphing Interest" a concept originated by Owen Cook is thrown many times with the reader expected to follow. But if you had already studied pick up artist materials, what would be the use in reading what you've copied from Mystery Method? The interesting thing about this book is that the author's insecurities come through quite sharply. He is obsessed with maintaining the power and control with Asian women. In this respect the advice is pretty immature, and dates back to the early 2000s when a lot of people were still looking at dating and gaming this way. This is also where his rendition of Mystery Method really starts to go awry - he takes out the vital stuff that make it work. But it does mean giving your power away. And I guess he isn't (or wasn't) ready for that. I don't think you have any doubt about what I'm going to say about this one. Pass. Check out our ranking of Dating Asian Women advice to find something better.